Child abuse cases will be solved and prosecuted more successfully with a new child advocacy center in Wilkes County, said Kisa Posey, assistant district attorney for the 23rd judicial district. A grand opening for the new center, SAFE Spot, was held Thursday afternoon. It’s in a renovated 1,200-square-foot facility at 1260 College Ave., Wilkesboro, and is next to Sheltered Aid for Families in Emergency (SAFE), which sponsors the center. SAFE Spot provides better coordination between the agencies involved in child abuse cases. It also means children do not have to go out of town for the interview process and only have to be interviewed once, said Mrs. Posey. She said it could take as long as a year and a half to two years for child abuse cases to be prosecuted. Getting the information soon and having the story on a DVD helps in getting a conviction. A crowd attended the 2 p.m. opening Nov. 13 including members of the Lowe's Heroes who helped to renovate the space. SAFE Spot provides comprehensive, community-based services to children and families affected by sexual abuse or severe physical abuse. The child friendly center has been created as a nonthreatening spot for children who have been abused, said Shellie Bowlin, coordinator for SAFE Spot. “It a sad fact. Child sexual abuse is a big problem in Wilkes. But SAFE Spot will improve care for abused children and will aid in the investigation and prosecution of crimes against children,” said Mrs. Bowlin, during the grand opening. She said a multidisciplinary team from the Wilkes Department of Social Services, law enforcement, mental health, Guardian ad Litem, district attorney and the public school system have been meeting for the past two years to collaborate cases. “Communication has really opened up with the meetings and there is less duplication from the different agencies,” said Mrs. Bowlin. A local therapist, Jodi Province, is also a member of the team. Mrs. Province and three other local therapists, Erica Walker, Amber Dillard and Michelle Salley, have completed a year-long training program in Trauma-Focused-Cognitive Behavioral Therapy. “The therapy is a proven approach to help kids heal after abuse,” said Mrs. Bowlin. Mrs. Walker, acting director for SAFE, stressed that therapy cleans out the wound for children so healing can begin. “It used to be people thought an abused child was broken, but that is not true now,” said Mrs. Walker. “It takes a team to put a dent in this problem and it took a team to build this beautiful center. This wonderful place is a visible example of what can happen when people work together,” said Mrs. Bowlin. The center has been the site of several child abuse interviews for the past month. Those interviews are done by one of four trained people in a comfortable, nonthreatening space. A one-way zoom camera allows for people involved in the case, such as law enforcement, to watch the interview while the interview is in a nearby conference room. The camera is placed near the ceiling and is covered by a small wooden replica of a doghouse to make it less threatening to a child. The animal theme is seen throughout the center with dog paws near the entrance. The exam room is filled with hand designed and painted animals on the wall and ceiling to distract children while they are being examined. The exam room will be used once a supervisor is hired, said SAFE officials. They expect that to occur by early 2015. Mrs. Bowlin thanked the following contributors for their assistance with SAFE Spot. They include The Health Foundation, Lowe's Charitable and Educational Foundation, The Cannon Foundation and the N.C. Community Foundation. Wilkes Community College (WCC) students provided extensive work on the center. They include building construction students under Dwight Hartzog who built the center; Michael Wingler, WCC associate vice president of information technology and students in that area who designed the video recording system; Erin Guffey, WCC student who created the Spot logo and Matthew Jordan, WCC graduate who assisted with the development of the building plans. In-kind donations were made by Key City Furniture, McLean Floor Coverings and Office Furniture Concepts. Dwaine Swink and Cubic Design Group designed the space and helped supervise construction. Lowe's Heroes Team, under Curtis Parker and Josh Brown who provided 60 volunteers working 500 hours. Recognition level donors are Julius C. Hubbard Jr., Mr. and Mrs. Tim Murphy, Judge and Mrs. Julius Rousseau Jr.
“We appreciate all the caring folks from across the community who contributed to the center’s fundraising drive. You have all played an invaluable role in bringing a brighter day to abused children in Wilkes and we appreciate you all,” said Mrs. Bowlin. Architect Dwaine Swink of Cubic, Inc. (right) volunteered his time to design the new center. Wilkes Community College architecture student Matthew Jordan drew the center's building plans. Wilkes Community College building construction students constructed the center as a class project under the direction of instructor Dwight Hartzog. WCC instructors and students also installed the center's closed circuit TV system and designed the center's logo. Three local nonprofit agencies are launching a five-year program to help prevent child sexual abuse by training parents, teachers and others who work with children. Joining the SAFE Spot Child Advocacy Center in sponsoring “Stewards of Children” are Communities In Schools (CIS) of Wilkes County and Wilkes Community Partnership for Children. The goal is to train 5 percent of the adult population of Wilkes County in “Stewards of Children,” a national multi-year program to prevent child sexual abuse, said Tim Murphy, family advocate for the SAFE Spot Child Advocacy Center. SAFE Spot Child Advocacy Center has assisted 100 sexually abused children in Wilkes since 2014, said Murphy. It was developed by Darkness to Light, a Charleston, S.C. nonprofit agency. “Stewards of Children” is recognized as a model program by the federal Office of Juvenile Justice and Delinquency Prevention, said Murphy. The meeting Wednesday gave those attending a preview of the training and was designed to motivate them to take the training, organize a training and get their workplace involved as a partner in training, said Murphy. The program, includes a free two-hour training called “Darkness to Light,” that teaches participants how to prevent, recognize and react responsibly to child sexual abuse. The training features the video stories of survivors who find hope after abuse. Following the video, training participants discuss child safety issues and develop personal plans to take action on what they learn in the training. Murphy, Glendora Yarbrough, CIS executive director and her staff and Susan Cogdill, executive director for Wilkes Community Partnership for Children and members of her staff, have received the training. Yarbrough said it moved her on an emotional level and also made her aware of safety precautions for CIS and the children it serves. The 150 CIS volunteers and board members are required to take the training now, said Yarbrough. Cogdill received the “Darkness to Light” training several years ago. “I was sold on offering it in Wilkes when Glendora mentioned it. Even after two times I find “Darkness to Light” training riveting. “It moves me emotionally each time and makes me understand the responsibility that we all have to prevent child abuse,” said Cogdill. Partnership for Children staff will all receive the Stewards of Children training so they can support the trainings for childcare providers in Wilkes, said Cogdill. The training will also be provided for the Wilkes Partnership for Children board. The training efforts began last November and about 100 adults are already trained, including BROC Head Start staff and employees at the Wilkes County Public Library. People attending the Wednesday session watched the video hearing stories of survivors of sexual abuse. Murphy led the discussion following the video. One person noted that sexual abuse used to be something you suspected but did nothing about. In the 1980s people were more afraid of their children being abducted. “Now we know the real danger is someone who children know because in most cases of sexual abuse, the perpetrator is someone the child trusts, but shouldn’t,” said Murphy. By the numbers from this week’s meeting, it looks like the agencies hope to provide Stewards of Children training to 2,000 Wilkes County adults over the next five years could be well under-way. Organizers hope to train 400 adults this year. Of those attending, 35 were from government agencies, private non-profits, churches, schools, youth serving organizations and private businesses. Seventeen have already said they will take the next training and eight are interested in doing it at a later date, said Murphy. Twenty-two want to host training and 11 are interested in sponsoring a program at their workplace, said Murphy. “By reaching five percent of our adult population, we’ll reach a tipping point where abuse prevention starts to become second nature in the community,” said Murphy to the group. Future trainings will target parents and adults who work with youth. Organizers said their goal is to see abuse prevention practices become commonplace everywhere kids are, including homes, schools, churches and all youth activities. The agencies are actively seeking community institutions that can organize and host trainings for professionals and parents. The next open Stewards of Children training is Wed, Feb. 17, 1-3 p.m. at the Wilkes County Public Library in North Wilkesboro. The training is free and the public is invited to participate. Organizers said there is an urgent need for the training. When unreported and untreated, child sexual abuse can cause many immediate and long-term health problems, including mental illness, substance abuse and chronic disease, said Murphy. The average lifetime cost per victim of child sexual abuse is $212,012. Next to murder, child sexual abuse is the most expensive crime in America, said Murphy. The Health Foundation, Inc. and the Kulynych Family Foundation. More information about upcoming trainings and online registration is available at www.safespotwilkes.org/stewards. Abused children in Wilkes County have a cheery, child friendly place to get help, thanks to the efforts of Lowe’s employees. About 40 employees at Lowe’s Customer Support Center in Wilkesboro recently donated their time and talent to add child friendly touches to the new SAFE Spot Child Advocacy Center. The workers participated as part of a Lowe’s Heroes team. The Lowe’s Heroes program is a company-wide initiative that offers employees opportunities to work on renovation projects in local schools and non-profits. Team co-captains Josh Brown and Curtis Parker said they reviewed several project possibilities, but in the end, their sympathy for the plight of abused children led them to select the child advocacy center. “While our Lowe’s Heroes team set out to serve and make a difference in the community by helping others, it did not take us long to realize that the real heroes are at SAFE Spot. It was an honor and a true privilege to serve in this capacity and, above all, a very humbling experience that left us feeling truly blessed,” Parker said. All told, 39 employees devoted 523 hours of volunteer time to the project. Lowe’s donated $2,780 in materials at store cost. 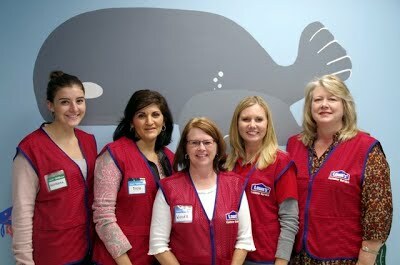 Team members collected an additional $322 to provide stuffed animals and journals to children seen at the center. SAFE Spot officials say they appreciate the effort and creative flair that went into creating the facility’s new look. Workers painted accent walls, installed whimsical wall graphics, brought in furnishings and added Spot, the center’s canine mascot, to two walls. A small team led by Reene Parker transformed SAFE Spot’s medical room into an undersea world with whales, dolphins, colorful tropical fish, an octopus and Spot, sporting a snorkel, all painted freehand. In the center’s interview room, team leader Curtis Parker designed and built a small replica doghouse for Spot, with help from Carolina Heritage Cabinetry of North Wilkesboro. The team also renovated the adjacent SAFE offices, improving privacy and adding a client consultation room. Heroes team participants include: Addrena Clemens, Alexandra Capecci, Brenda Parker, Cole Susi, Eva Adams-Myers, Grey Triplett, Heather Whitley, Holly Richardson, Honey Susi, Jacklyn Richardson, Jason Spradlin, Joseph Gryder, Kamela Hemric, Kathi Johnson, Kathy Houck, Kelly Lyon, Kimby Page, Kristee Huffman, Laquanta Baxter, Megan Hutchins, Michael Wagoner, Michelle Miller, Mike Winesette, Natalia Ceballos, Patricia Duncan, Phillip Smith, Reene Parker, Rick Neudorff, Ryan Falise, Shannon Massengill, Sherry Dancy, Stefan Susi, Tamera Miller, Teresa Ray, Terri Waddell, Wanda Parker and Wendy Sherwood and Co-Captains Curtis Parker and Josh Brown. SAFE Spot Child Advocacy Center is located in a 1,200 square foot facility adjacent to the SAFE, Inc. offices off School Street in Wilkesboro. SAFE Spot will provide comprehensive community-based services to children and families affected by child sexual abuse or severe physical abuse. Some victim services, including forensic interviews, mental health therapy, victim advocacy and case coordination, are already being provided by the center and its partners. Medical services will be added soon. The center’s multidisciplinary team has been meeting monthly since January 2013 to coordinate investigations and improve community response to victims. The team includes law enforcement officers, child protective services personnel, prosecutors, advocates and care providers. SAFE Spot is a service of SAFE, Inc., a United Way of Wilkes partner agency. More than three dozen Lowe's employees participated in the makeover, donating over 500 hours of their time to the project. Project co-captain Curtis Parker (right) and Phillip Smith install privacy walls in the SAFE offices. Parker devoted more than 100 hours of his time to this project. These creative ladies transformed the SAFE Spot medical room into a captivating undersea world. From left: Alexandra Capecci, Tricia Duncan, Wanda Parker, Heather Whitley and crew leader Reene Parker. Alexandra Capecci and her octopus lend cheer to the center's medical room. Five year old Janie has a smile that could melt your heart, but behind that smile lurks a world of hurt. Janie (not her real name) was neglected by her drug addicted mother, and sexually abused by her mother’s boyfriend. By the time authorities intervened, Janie was acting out at school, wetting the bed and having frequent nightmares. Janie is the type of child often referred to as “damaged goods”, a phrase that really bothers therapist Jodi Province. Province and her colleagues Amber Dillard, Michelle Salley and Erica Walker recently completed a year-long training program in Trauma Focused Cognitive Behavioral Therapy (TFCBT) to help children like Janie heal after abuse. TFCBT is an intensive therapy with a strong track record of helping children heal after abuse. In North Carolina, 90% of children treated benefit from TFCBT. They sleep better, have fewer stress symptoms, and do better in school and at home. Over the course of 12 to 16 sessions, therapists guide children and their non-offending caregivers through a variety of activities designed to help them face and master traumatizing events. In therapy, children learn how to express feelings instead of acting them out. They also deal with cognitive distortions, the ‘stinking thinking’ that is common in abuse victims. “I’ve had clients tell me, ‘I’m broken. No one will ever love me.’ By the end of the process, they see things differently,” therapist Erica Walker says. Children also learn how to relax. “Children are often on high alert after trauma,” Province says. “Their senses are heightened and they are in defense mode.” Therapists teach children techniques they can use anywhere, anytime to help calm themselves. TFCBT forces children to face their fears, a process many children and caregivers would rather skip. “Children want to avoid talking about the trauma, but avoiding is not healing,” Salley says. She compares the process of talking about abuse to the process of cleaning out a deep wound. It hurts, but it’s necessary for healing to occur. Not talking, especially in cases of sexual abuse, can be a bigger problem, therapists say. Keeping the subject taboo only magnifies the shame a child may already be feeling. After many weeks of preparation, children are eventually ready to discuss the abuse in detail. By this point, they know how to manage their stress and they’ve challenged some of the distorted thinking about themselves and their abuser. “Telling the story in detail is like the reward at the end of a long race,” Walker says. “It’s the child’s opportunity to work through and reframe what happened.” Talking directly about the traumatic event helps reduce intrusive thoughts that can trigger physical symptoms. Non-offending caregivers are included throughout the process. “A big part of TFCBT is parent education,” Dillard notes. Parents learn specific techniques to handle problem behaviors, and they get support to address their concerns and help manage their own stress. This strong emphasis on parental involvement is important, says Tim Murphy, community educator at SAFE Spot, a center serving abused children. “The way a victim’s family responds to abuse can make all the difference in the child’s ability to recover. Non-offending parents and caregivers want to help, but they don’t always know how. Most of them jump at the chance to be involved in their child’s therapy,” Murphy said. Over the past year, SAFE Spot Child Advocacy Center has subsidized therapy for 33 child abuse victims. Thankfully, most of them did not require the most intensive treatment because their level of daily functioning did not require it. Therapist training was provided by the North Carolina Child Treatment Program, a partnership between the Duke-UCLA National Center for Child Traumatic Stress, the Center for Child and Family Health and the School of Medicine the University of North Carolina at Chapel Hill. Financial support for local therapist training is being provided by The Health Foundation, Inc. The TFCBT therapists work at Jodi Province Counseling Services, a SAFE Spot contractor. Four members of the SAFE Spot therapy team completed a Trauma Focused Cognitive Behavioral Therapy learning collaborative provided by the N.C. Child Treatment Program. 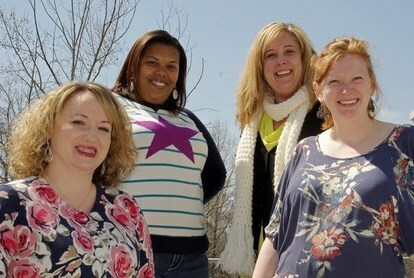 Pictured (from left): Amber Dillard, Erica Walker, Michelle Salley and Jodi Province. Ten local professionals recently completed a week-long course on how to interview child abuse victims. The National Child Advocacy Center’s “Forensic Interviewing of Children” training course was provided by SAFE, Inc. Aug. 5-9, 2013 at First United Methodist Church in North Wilkesboro. The training was funded by a grant from the N.C. Governor’s Crime Commission. Forensic interviewers use child friendly, legally sound methods to gather factual information from children. Forensic interviews are often conducted in suspected cases of child sexual abuse or severe physical abuse. Participants learned how to establish rapport and elicit information impartially using NCAC’s Child Forensic Interview Structure, a research and practice-informed protocol. Training participants include Laurel Ashley of the Wilkes County Department of Social Services, Jennifer Becker, R.N. of Wilkes Regional Medical Center, Angie Church of the Wilkes County Schools, Cindy Coffey of the Wilkes Department of Social Services, Sonya Freeman of the Wilkes County Department of Social Services, Dee Fuentes of the Wilkes County Health Department, Det. Nancy Graybeal of the Wilkes County Sheriff’s Office, Tim Murphy of SAFE, Inc., Jodi Province of Jodi Province Counseling Services, and Michelle Salley of Jodi Province Counseling Services. Andra Chamberlin, M.A., was the course’s lead instructor. Mrs. Chamberlin is a trainer and forensic interviewer with the National Children’s Advocacy Center in Huntsville, Ala. She has 23 years experience in child protection and 15 years experience conducting forensic interviews of children. Mrs. Chamberlin has testified as an expert witness and has presented forensic interview training at local, regional, state and national child abuse conferences. Attorney Justin Fitzsimmons taught the course’s legal topics section. Fitzsimmons is a research specialist with SEARCH, the National Consortium for Justice Information and Statistics. For eleven years, Fitzsimmons served as an assistant state’s attorney in Kane and DuPage Counties, Ill., where he prosecuted cases involving sexual exploitation and digital evidence. Fitzsimmons has published articles, drafted legislation and presented trainings on child exploitation. Ten local professionals completed “Forensic Interviewing of Children” training Aug. 5-9, 2013 in North Wilkesboro. Participants learned how to establish rapport with children and gather information using a nationally-recognized interview protocol. Pictured from left: Training participants Tim Murphy, Sonya Freeman, Jodi Province, Michelle Salley, Dee Fuentes, Angie Church, lead instructor Andra Chamberlin, training participants Nancy Graybeal, Cynthia Coffey and Laurel Ashley and training host Keena Eller. (Not pictured: Jennifer Becker). Coffey, Graybeal and Murphy are currently providing forensic interview services at SAFE Spot. United Way of Wilkes’ slogan, “Give, Advocate, Volunteer,” was fully in evidence Tuesday at the fourth annual Great State Hero event at the Stone Center for the Performing Arts in North Wilkesboro. Event sponsor was Great State Bank. The dinner and awards ceremony was the kickoff for the 2018 United Way of Wilkes County fundraising campaign. Twelve people were nominated to receive Great State of Wilkes Hero awards in the categories of crisis intervention, health improvement, education advancement and future generations. Amanda Perry, emcee and United Way board chairman, said, “We are here tonight to honor those who, with determination and compassion, are a beacon in the community.” Nominations were received from the community and winners were selected by a volunteer group from different sectors in the county. Wilkes Communications was the awards sponsor. Steve Handy from WKBC Radio introduced the nominees. A short video clip produced by River Street Production was also shown about each nominee. Tim Murphy of North Wilkesboro received the award for Crisis Intervention, which was sponsored by the Leonard G. Herring Family Foundation. Murphy has spent 40 years as a teacher, counselor and advocate for the children in Wilkes County. He is currently a family advocate for SafeSpot, Wilkes County’s child advocacy center, and works with non-offending caregivers of children who are suspected victims of child sexual abuse or severe physical abuse. Murphy also provides training in child sexual abuse prevention through Stewards of Children, and has trained over 1,200 people. Jodi Province of Jodi Province Counseling Service and Joyce McQuerry, a volunteer with Samaritan Kitchen, were also nominated in this category. Winning the award for Health Improvement, sponsored by Wake Forest Baptist Health Wilkes Medical Center, was retired ophthalmologist Dr. John Oliver, who practiced in Wilkes for 43 years. He also served on the board of directors for Wilkes Regional Medical Center, served as Wilkes Regional’s chief of staff, and currently servces on the Health Foundation’s board of directors. Oliver was noted for seeing patients without insurance and without charge, for making house calls to people who couldn’t get out and for allowing people to come to his home for visits. Other nominees in Health Improvement were Evelyn Lipford, a CNA with hospice and LaDara Absher, a CNA with the Senior Companion Program. Robinson has “tirelessly committed her time, her energy and her resources for the people of Wilkes County throughout her career as a teacher and coach and her work with nonprofit agencies.” She has continued volunteering even though she has battled cancer three times, and serves on the board of trustees for Wilkes Community College, on the board of CareNet of Wilkes and has served on the board of directors for the Wilkes Partnership for Children. Landon House, a community volunteer who is employed by Carolina West Wireless, and Loretta Harris, a foster grandparent at C.C. Wright School, were also nominated in Education Advancement. Other nominees in Future Generations were Alex Gentry, a freshman at East Wilkes High School, who serves his community through Scouts, his church, home and school, and Leanna Earp, an Air Force JROTC member. Guest speaker was General J.R. Gorham of Kernersville, the first African-American brigadier general of the North Carolina National Guard. He currently serves as director of special projects for the N.C. Dept. of Public Safety and is an author and motivational speaker. A graduate of East Carolina University who grew up in the Falkland community near Greenville, Gorham spoke about the life lessons he learned from his sharecropper father, Roy “Joy” Gorham. He has compiled these lessons into a book, “Sharecropper’s Wisdom.” Following the dinner, Gorham autographed copies of his book. Dan Little, United Way campaign chairman, gave closing remarks, saying he was was happy to announce $75,000 has already been raised by the pacesetter group, toward the goal of $500,000. Thirty-six percent of the county uses United Way services in a year, he said. Pre-dinner piano music was provided by Sam Graham. Event entertainment was by Benjamin Barker, who played selections on the harp and hammered dulcimer. PSG Custom Fabrication sponsored the dinner, which was provided by Branciforte Brick Oven. Two members of SAFE Spot Child Advocacy Center’s child protection team were honored Sept. 11, 2018 as nominees for the United Way’s Great State Hero Award. Jodi Province and other counselors in her practice help children heal after abuse. Jodi is bringing the Kidpower child protection program to Wilkes County.